Of all the people who were in the Student Union on Thursday as speaker after speaker described the life that Jerry Colangelo has so well lived, no one has known him longer than his sister Rosemary Howell. And she captured it like no one else could. Jerry Colangelo will be more than just a name on a wall. As is his style, he promises to be heavily involved in the Colangelo College of Business. 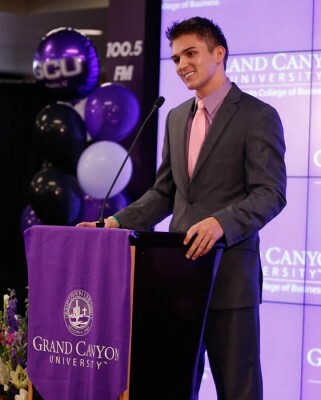 That big heart will now be shared with Grand Canyon University in an even bigger way. 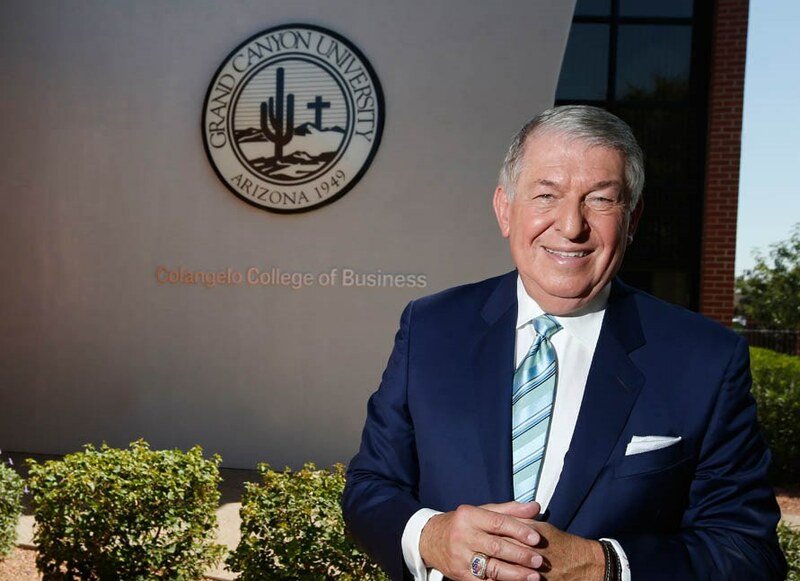 Before an overflow crowd at a press conference/celebration, the University announced that the business school has a new name: the Colangelo College of Business. His name will continue to be on the Colangelo School of Sports Business, created three years ago with his considerable input. 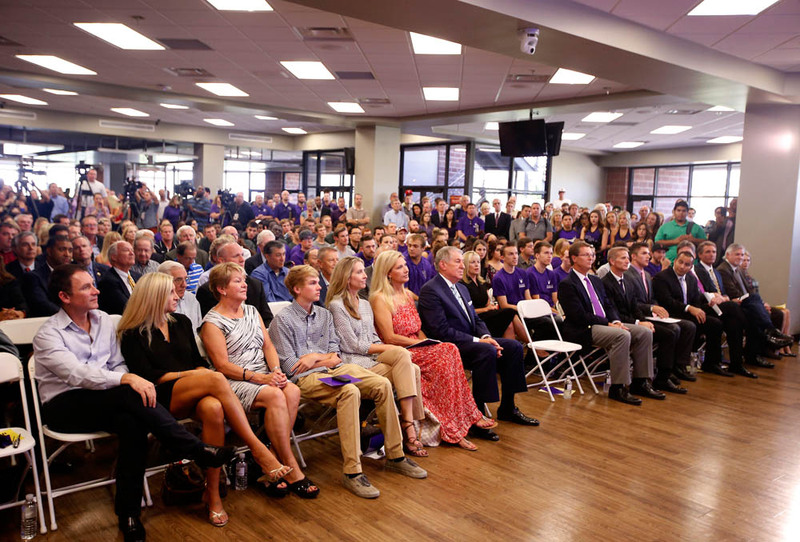 This wasn’t just a red letter (or purple letter) day for GCU. To borrow one of Colangelo’s favorite terms, it was a gold standard day. A large crowd turned out for the Colangelo announcement. That’s why this is anything but one of those ceremonial, in-name-only designations. Colangelo is always a man on a mission, whether he’s building a sports franchise, shaping a college curriculum or just puttering around the house. In addition to his family, the crowd included a host of dignitaries — including Phoenix Mayor Greg Stanton, U.S. Sen. Jeff Flake (R-Ariz.) and Phoenix District 5 City Councilman Daniel Valenzuela, all of whom spoke — and longtime friends and business associates of Colangelo. 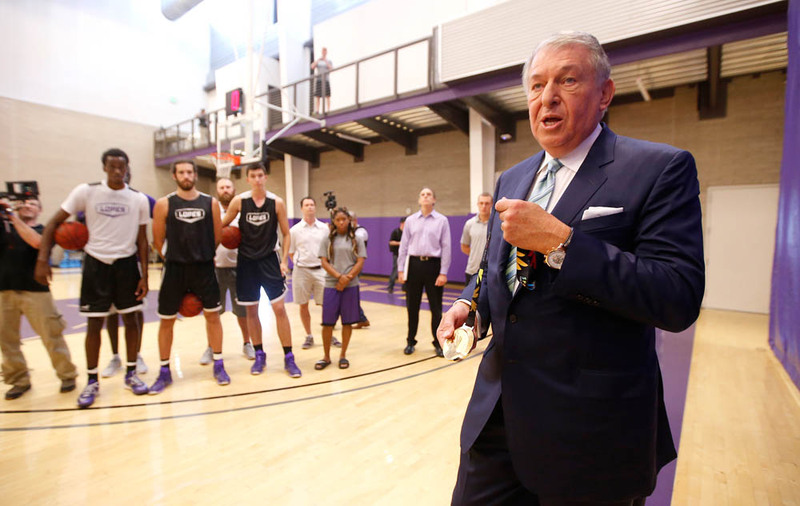 There was Bob Machen, who first worked with Colangelo as business manager of the Phoenix Suns in 1969 and recently retired as GCU’s senior vice president of campus development. They used to have lunch three or four times a week when they were both with the Suns, and it was Machen who first called Colangelo to get him hooked up with GCU in 2011. Machen said that when he suffered a heart attack a few years ago, Colangelo and his wife, Joan, were at the hospital that night even though visiting hours had ended. “He’s absolutely a regular guy,” Machen said. Sports business student Austin Walker delivers his speech at the press conference. Walker said he had never delivered a speech “remotely close” to that magnitude, to that large of a crowd. You’d never know it. He nailed it. No question about that. Colangelo got up immediately to shake Walker’s hand, and his heart clearly was touched. GCU President/CEO Brian Mueller said that positive effect on students was one of the reasons he wanted to expand Colangelo’s sphere of influence in the College of Business. This all came together in the last three months, while Colangelo was busy shepherding the U.S. men’s basketball team to its fourth straight gold medal in international competition. During his address to the men’s basketball team before the press conference, Jerry Colangelo shows off the gold medal his U.S. team won in the recent FIBA World Cup. The University’s first major initiatives in conjunction with the announcement are the creation of two scholarships bearing Colangelo’s name — one for a Phoenix Union High School District student, one for a Canyon Christian Schools Consortium student. Also, honor students will be known as Colangelo Scholars. You can be sure that all of the 2,001 CCOB students, no matter whether they receive any honors, will get an indoctrination into the Colangelo Way. They will hear the word integrity a lot. They will hear about being prepared. And they certainly will hear about the importance of being willing to work hard — already in evidence during the press conference when Colangelo’s grandson had to leave early to go to his job. How much will Jerry be involved in the Colangelo College of Business? Just ask his sister. And it’s not just a heart of gold. It’s a heart with a gold standard.